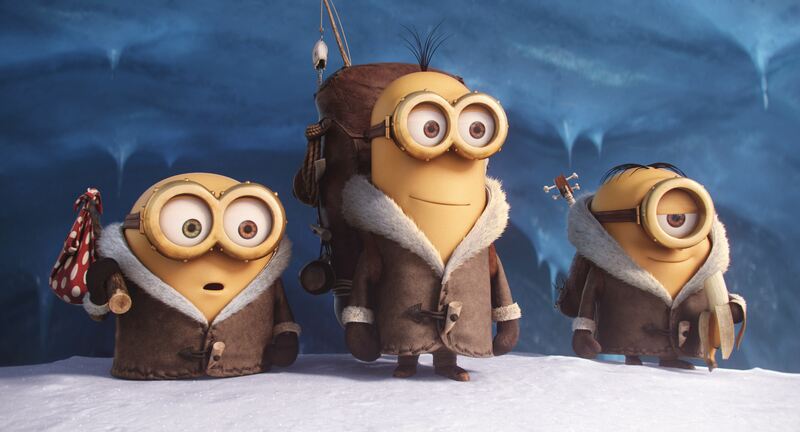 After the surprisingly good Despicable Me and its sequel, studio execs at Universal must have rubbed their hands with glee at the thought of all the extra money they could make off some cute little yellow blobs (THINK OF THE PLUSH TOYS!) 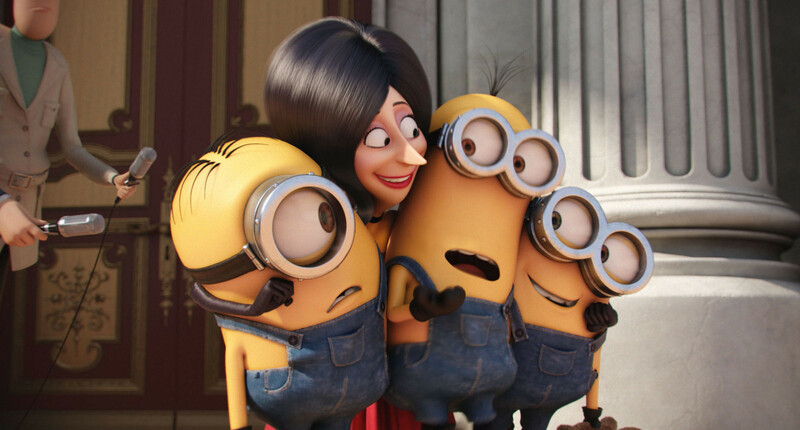 Kiddies everywhere were besotted with the Minions (and you can imagine that these young audience members will forever associate the term ‘minions’ with these animated cuties) and will be out in full force these school holidays to see more of their shenanigans on the big screen. Set before the events of the Despicable Me films, Minions charts their journey from prehistoric times up until 1968 in their quest to find the perfect villainous leader. Enter Scarlett Overkill (voiced by Sandra Bullock) – the most powerful supervillain in the world, who enlists Kevin, Stuart, and Bob’s help in stealing the Queen’s crown jewels. It’s somewhat disheartening to hear the bulk of primary school kids say that they can’t wait for the Minions movie, while the clearly superior animated school holiday release Inside Out gets left behind in the dust. Because when it comes to animation: PIXAR ALWAYS WINS. There is no contest. And these kids surely have a lot of growing up to do if they think otherwise. Minions doesn’t come close in terms of the heart, brains, and valuable lessons in Inside Out, but for something to make you chuckle, it does its job. So cute I could die. 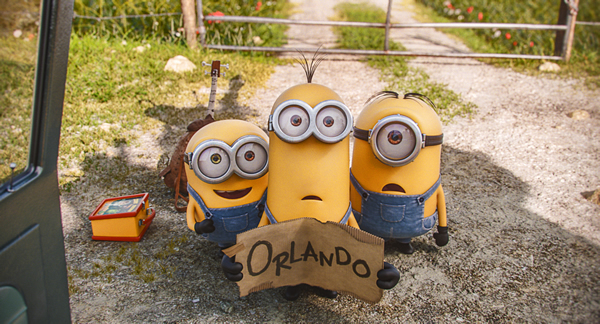 The Minions are undeniably cute (especially Bob!) and the slapstick nature of their animation will make even adults laugh out loud. Their mostly incomprehensible language (with the exception of a few basic words and some foreign phrases familiar to adults) makes them accessible to all ages, and as with Shaun the Sheep the lack of sensical language proves quite a smart choice. The absolute best moments (well, at least to this musical nerd) are the two musical numbers (sans the usual lyrics) from Singin’ in the Rain and Hair – a nod to Broadway will always win my heart. The light jabs at the Brits are good value too, along with some entertaining notions of how great rulers perished at the accidental hand of the Minions (don’t worry – they steer clear of Hitler). Unfortunately there’s no referencing that musical. Unsurprisingly, Minions has nothing on Disney, but the Despicable franchise has proved its worth up amongst the other mainstream animation contenders. Kids will love it (though be warned there are quite a few deaths as well as a scary clown) and parents could certainly do worse. Their wallets, however, are another story. The overall effect is mildly diverting and almost instantly forgettable.